It was a great day to be a crow! Housebound for so long, it was a wonderful thing to get out on to the ridge today with Max.The world was our oyster and there was no one else out walking at that particular time of day. Amazing stuff to be observed and enjoyed. There were no fewer than twenty large crows, known here, as common ravens, dive bombing one another and hanging on the strong winds of today. Every third crow seemed to be clutching a mouse in its claws or chomping down on a mouse dangling from its beak. It was such evidence of the warp and weft of life’s experiences…such tragic sadness combined with utter jubilation. They tag-teamed one another, twisting and contorting in the wind to wrestle the mice out of one another’s control. At one point, one of the mice was dropped directly in front of us in the snow. Its lifeless body confronted me with the concrete reality of the natural spin of nature…as long as it was swinging from the mouth of a raven, it was just a silhouette against the grey sky, a toy, a trifle. Immediately, the powerful bird swung down to recover its prize. Max took a brave and almost aggressive stance, barking and leaping at the big bird until it hovered just a couple of feet above Max’s head, determined to assert itself over the mad dog. I stood motionless, watching, amazed, when all of a sudden Max cowered low to the ground, looking up at the aggressive chattering crow in tremendous fear. I ran ahead with Max following, but the crow pursued us, continuing to manage its balance and distance above the center of Max’s body. Max’s eyes flared, the whites of them twisted toward the sky, his neck churned around in exasperation. Finally, after some time, the waiting bird, angled and made its return to the mouse. As we continued on our walk, the numbers of crows continued to grow, a line of tumblers on the air…a single hawk joining them, but immediately stalked by three and four of the black birds at a time. The wind pushed hard against my body! Max ran, barking for no reason, the hair on his face pushed back against his head…a streamlined bullet running against the powerful wind. Below, in the shelter of the hill, the same dance was happening, but instead of common ravens, the magpies were ditching out of the branches of shrubs again and again, celebrating the slightly warmer temperatures and the feast of field mice that had also come out of the state of frigid waiting into a lively world of stronger and weaker and unburied vegetation. 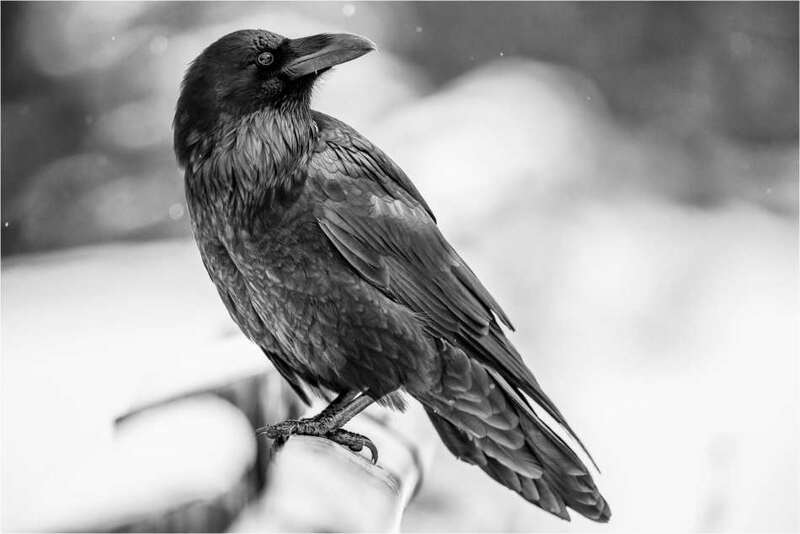 Gratitude to photographer, Christopher Martin for the use of his image of a Common Raven in the wintry months. You can enjoy much more of his work here…I’ve admired his images of a home I know so well, for a long time! This entry was posted in Angels, Going Somewhere?, Observations of Nature and tagged Bird Watching, Common Ravens, Dog Walking, Freedom, Grief, Landscape, Life, Nature, Observations of Nature, Playfulness by Painter Lady. Bookmark the permalink.